“...the Scythe Big Shuriken 2 is in a unique place where it is one of the smallest low profile CPU coolers on the market yet packs the performance of low profile CPU coolers that are much taller. Scythe update there very popular Big Shuriken. Not only is it still only 58mm tall but Scythe have added an extra heatpipe to increase performance and made it compatible with Intel's new LGA2011 socket. The update of Big Shuriken is equipped with an additional 6mm heatpipe as well as an additional row of fins. 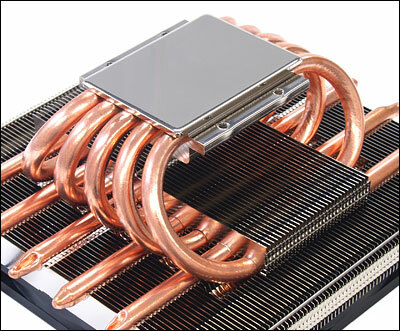 This significantly increased the cooling capabilities of the cooler. Scythe have done this and still kept the cooler under 58mm in height which provides compatibility especially with HTPCs (Home Theatre Personal Computers) and computer systems with limited space. In addition higher compatibility with new generation chipset motherboards was established by inventing F.S.M.B.4 (Flip Mount Super Back-Plate 4) mounting system, so now the Rev.B provides compatibility with the new Intel LGA2011 socket. Compared with its predecessor the Big Shuriken 2 Rev.B is equipped with an additional heatpipe as well as an additional row of fins. By these improvements combined with a 2,000 rpm Slip Stream 120 Slim Series fan, higher cooling efficiency could be achieved. By applying the orthodox method of pointing the airflow of the fan towards the motherboard, chipsets and MOS-FETs on VR modules can be cooled simultaneously. The Big Shuriken 2 Rev.B is equipped with a new Slip Stream 120 Slim PWM fan (2000 RPM) with small motor hub for better airflow. The fan can be replaced with general 120mm fans with open corners for screw holes, if required. One of the main characteristics of the Big Shuriken 2 Rev.B is its outstanding compatibility. With it being only 58mm in height it is versatile for all systems and a perfect solution for low Profile PC chassis. In addition, the new F.M.S.B. 4 (Flip Mount Super Back-Plate 4) mounting system provides high compatibility with new generation chipset motherboards. Big Shuriken 2 Rev.B is also compatible to Intel's new LGA2011 Socket. At last something that actually does what it claims. Using AMD “Cool and Quiet” it really is quiet and it does keep the CPU cool. Fitting was easy and quick and the instructions clear. I would recommend this fan to anyone who can use a screwdriver.